Red and inflamed gums, notice the swollen tissue beneath the teeth. Why do my gums bleed? Common complaint patients say to me is their gums bleed when brushing their teeth or when they are flossing. And as such bleeding gums is often a sign of bacterial infection and gingival irritation. Gingivitis – Gums are irritated and may be swollen. This may be due to plaque and bacteria buildup along the gum line, and is typically from insufficient brushing and flossing. Periodontitis – Gums and supporting bony structures of the teeth have bacterial and calculus (hardened bacteria and plaque buildup) irritation. Pregnancy – Swollen and bleeding gums may occur during pregnancy due to increased level of progesterone. Immunosuppressants – Patients who have undergone organ transplants may be placed on medications such as cyclosporine. Cyclosporine is an immunosuppressant used in organ transplant recipients and for psoriasis. Calcium channel blocker agents such nifedipine and amlodipine have also been associated with gingival overgrowth. Nifedipine and Cyclosporine may cause drug-induced gingival overgrowth, and thus in combination with plaque buildup, this leads to bleeding gums. How to treat bleeding gums? Primary method would be to ensure daily habit of brushing and flossing. Regular 6month checkups and dental cleanings are helpful Main benefit of using dental floss is that it physically removes bacteria and plaque trapped in between the teeth and along the gum line. A water pick may also be a useful adjunct tool. 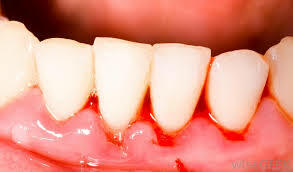 Bleeding gums due to periodontitis may require a “deep cleaning” or root scaling and planing to remove hardened bacteria and calculus beneath the gum line. After the deep cleaning is done, more frequent maintenance cleanings and diligent at-home care may be required to prevent the calculus buildup from reoccurring. Pregnancy induced gingival overgrowth and bleeding gums would require the patient to be extra diligent with daily brushing and flossing. After delivery when progesterone levels go back to normal levels, the gum inflammation and swelling would typically improve on its own. For those on immunosuppressants such as cyclosporine and nifedipine, regular dental cleanings and at home daily brushing and flossing is critical to ensure optimal gum health. Good oral hygiene is critical to ensure teeth and gums stay healthy during treatment. If you have any questions regarding why your gums bleed, be sure to consult your family dentist and hygienist.